OneRepublic is an American, self-proclaimed "genreless", band formed in Colorado Springs in 2002 by Ryan Tedder and Zach Filkins. After a few years of moderate success, they have since drawn mainstream attention with the release of their single "Apologize," which has sold in excess of 7 million singles worldwide. The song, according to SoundScan Data, is one of only two songs that have reached 3 million legal downloads in history. A remix of "Apologize" was featured on Timbaland's Shock Value and the band's debut album, Dreaming Out Loud, produced by Greg Wells. Their debut album was released in the United States on November 20, 2007, with international release dates staggered throughout early 2008. As of June 14, 2008, Dreaming Out Loud had sold 761,298 copies in the U.S. with the bands total album sales coming to over 1.5 million worldwide so far. The band's second single, "Stop and Stare," has also crossed the 2 million mark in terms of worldwide single sales. Their third single, "Say (All I Need)", has been released in the UK and in the U.S.
OneRepublic's song "Apologize", written by Ryan Tedder, was released in its original version on the band's debut album Dreaming Out Loud. The song was also prominently featured as a remix on Timbaland's 2007 release of Shock Value. The single, as featured on Shock Value, has gone 3x Platinum (marking three million copies sold in the U.S) and 5 million copies worldwide. It peaked at number three on the U.K. Official Top 40 Week on November 11, 2007. The week of November 10, 2007, "Apologize" was the biggest radio airplay hit in the history of Top 40 radio in North America, racking up an astounding 10,331 spins in one week. The song held the #1 position for five months before the record was broken by "Bleeding Love", a song co-written and produced by Tedder. The band performed "Apologize" live on Fox's So You Think You Can Dance on August 2, 2007, and with Timbaland on an episode of One Life to Live in October 2007. It was also played at the end of four television shows-- Cold Case episode "Sabotage," Smallville's "Hero," Hollyoaks and Gossip Girl episode "Hi, Society." The follow-up single to "Apologize" is "Stop and Stare". They performed "Stop and Stare" and "Mercy" live on the Smallville episode, "Hero," which aired March 13, 2008. They also performed "Stop and Stare" on the Australian version of So You Think You Can Dance on April 7, 2008. On May 21, 2008, the band appeared on the American Idol (season 7) finale performing a duet of "Apologize" with finalist David Archuleta. They returned to Fox's So You Think You Can Dance on July 3, 2008 with a live performance of their third single "Say (All I Need)"
Their fourth single and follow up to "Say (All I Need)" is "Mercy" and was released in the autumn of 2008. They released a second album, Waking Up, in 2010. From this album, they released four singles: All the Right Moves, Secrets, Marchin' On and Good Life. Their album peaked at No. 21 on Billboard and has sold 300,000 copies worldwide. 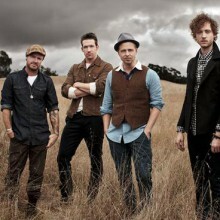 Respected venerators if you are reading this, you clicked on the page of the singer onerepublic in our eLyricsWorld. Our database consists of information about 52389 artists from all over the world also 829824 songs 122 of which are from onerepublic. Except for the artist's biography, on this page you can see brief information about them, which includes date of birth, style, record label Be conversant with all the news with onerepublic by adding RSS link. If you prefer you could directly visit the address you are on at the moment and look through the latest songs about the singer.